I’ve been monitoring CodePlex for a while now — looking out for VB.NET projects seeking additional help. Most of them were either not to my liking (too much reliance on third-party library files, too far outside of my interests, etc. ), but I did stumble upon one that I felt like I could help out with. I decided to help out with goTranslateIt. It’s not the most complex project out there, but I saw enough of the code to see opportunities for improvement. Realistically, I’m not sure how practical the application is in terms of real-world usage. For me, if I need to translate something, I typically just load up a web-based translator, get the translation, and I’m done. There aren’t many situations I can think of where people need to do enough translations where they’d want a winform-based application installed on their system. I like doing fine-tuning of GUI functionality or coming up with ways to make things a bit more efficient. I had a lot of opportunities for that. Also enjoyable was closing out the only open issue of the app — a bug that seemed to only affect translations for Simplified Chinese, Traditional Chinese, and Cajun Creole when using the Bing translation API. The problem was easy to identify and thanks to other changes I made during my initial code cleanup, the fix was pretty simple. 23AndMe is doing another holiday promotion. Previously, just having the “complete package” would give you free ongoing updates as new discoveries are made. You can opt not to do it beyond the first year, but when you buy it, you’re agreeing to a year’s worth of monthly updates, so you’ll have to pay for it either way initially. That means that the $99 discounted rate with the mandatory year’s worth of updates (at $5/month) comes out to $159. Not as good of a deal as before, but still decent… and I’m sure it’s probably a better business model for them in the long-run. For those of you who already use the service, like me, we’ll be grandfathered in and not have to pay for the updates. Sweet! The current genetic testing package includes Health & Ancestry reports. The Health reports are interesting for learning about health risks you might not realize you have or bad genes you might be passing down to kids in the future. It covers carrier status, disease risk, and drug response information. If you’re interested in stuff like this, it’s definitely worth checking out. At $99 (even with the extra $60 for updates), it’s definitely worth the money. This one took me a while to solve. The numbers were too large to fit any of the built-in datatypes, so I couldn’t solve this the easy way. I had to come up with a different approach. I decided to “kick it old school” and add up each column of digits individually. As long as I handled the remainders right, I figured it shouldn’t be too difficult. Originally, I just tried working with it as one giant string, like I had done in previous problems. Ultimately, it made more sense to just toss the 50-digit numbers into an array and work with it there. Not only did it work like a champ, but it was fun to do. I don’t know quite what it is about some websites that just leave me with a bad taste in my mouth. With Allstate, though, there are definitely a few things that come to mind…. I’ve stayed with Allstate more out of lethargic apathy than as a loyal customer. I’m just not a big fan of filling out paper work, so I don’t switch companies very often — not unless there’s a nice amount of financial incentive behind it. Since I don’t typically get into car accidents, I have no idea how good their service is when it comes to claims or any of that. Really, my only experience with them is through my online interactions when I need to pay bills, check my balance, or make adjustments to my policy. 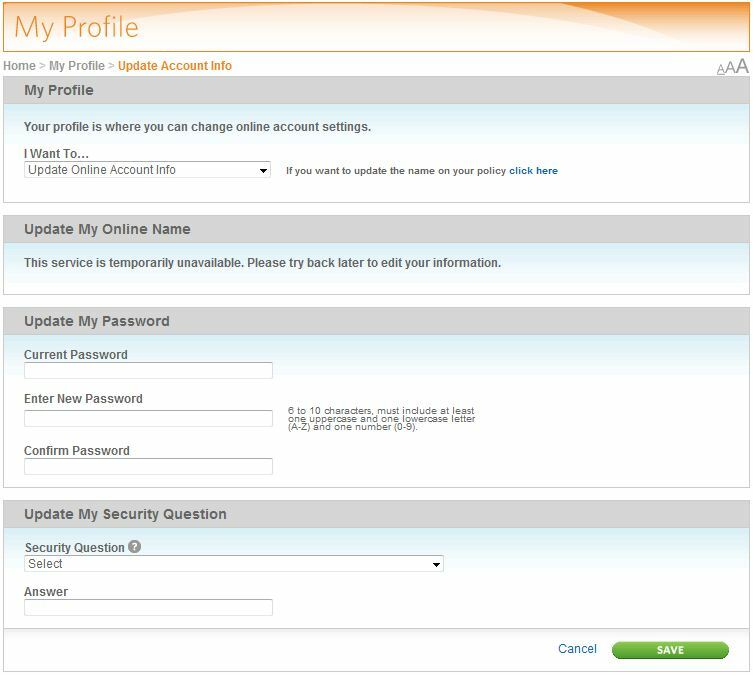 When I logged in this morning, though, I was “greeted” by a screen informing me that my account had been migrated to a new system and I needed to update my information. That’s fine. Apparently, they were toughening up their password security and added a “security question”. Pretty standard stuff these days, I guess. I’m still not a fan of having pre-defined security questions, but I never use real answers to them, anyhow, so I guess it doesn’t matter. After filling out the form and trying to continue, I was warned that my new password did not meet their requirements. Hmmm. I read the requirements again. Looks like I had missed the fact that the password could only be a maximum of ten characters. UGH! The password tried using had apparently been longer than that, so it was failing. I changed it to something temporary that would meet their requirements (and was less secure than my original password, mind you). Allstate apparently felt that “Password1” was way more secure than what I had been trying to use previously… Nice. After logging in, I went straight to the account details page. Especially when they are displaying all of the choices on the page, anyhow, why not just make them hyperlinks and be done with it? Whatever. I have no idea what “My Online Name” is, but the rest was pretty self-explanatory. I attempted to update my password to something I would actually be able to remember. No luck. I tried another. Nope. Apparently, it prevents you from using any of the past five passwords you’ve already used. I’m not logging into a missile silo or trying to transfer funds to an off-shore bank account, guys. I’m fine with warning users… “Hey! You used that password two months ago. Are you sure you want to use it again?” Trying to prevent me from using what I want, though, is silly. When systems only care about the most recent five passwords, it’s just a case of changing my password five more times to stuff I’m never going to use again. Now I can use the password I want. The bottom line is, antiquated password rules just look bad and make me feel like the company is either “out of touch” or use some old COBOL-based systems or something. Passwords are a big deal for me. If I can’t log in when I want without having to use some ridiculous password that has to be changed frequently, it’s just not worth it to me.